John F. Kelly would like you to know that the clumsy rollout of President Trump’s travel ban was definitely not President Trump’s fault. Kelly has disputed that story, but the Times sticks by its reporting. Regardless, Kelly didn’t think he or the president had much to apologize for. The DHS secretary predicted that the courts would eventually reinstate the administration’s executive order temporarily barring refugees and visitors from seven Muslim-majority nations from entering the United States. The administration will make its case before three federal judges on the Ninth Circuit Court of Appeals on Tuesday night. Kelly further suggested that the judges who had stayed the order were guilty of “academic” detachment from the life-or-death realities of national security. The secretary testified that it is “entirely possible” that dangerous people are pouring into the country now that the ban has been lifted, as the president has repeatedly claimed. And it’s true: It is “entirely possible” that a wave of jihadist refugees (who made it through America’s rigorous vetting process) happened to be on the cusp of immigrating when Trump took office — just as it is entirely possible that you will slip and crack your skull the next time you take a shower. Since the Refugee Act of 1980 established the current regime for vetting applicants, no refugee accepted into the United States has committed a major fatal terrorist attack on U.S. soil, according to an analysis by the Cato Institute. Further, no visa holder from any of the countries on Trump’s blacklist has carried out a fatal terrorist attack in the United States since 1975. Nonetheless, Kelly maintained that the travel ban was only temporary, and that no additional countries would be added to the current blacklist. 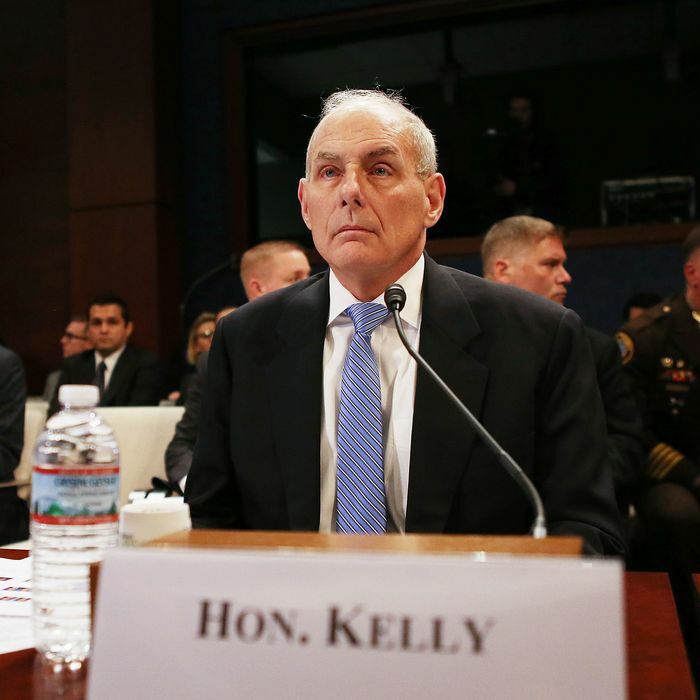 At other points in the hearing, Kelly tempered the president’s more aggressive proposals for immigration enforcement. The secretary said that the federal government would only cut funding to “sanctuary cities” on a case-by-base basis — and suggested that, even then, the administration would only revoke funds specifically earmarked for immigration enforcement. “If we are specifically giving grants for cooperation on the removal of illegal aliens and the department or city is no longer doing that, it seems irresponsible to me to continue giving them the money, but it will be case by case,” Kelly said. The secretary also said that he did not expect to meet Trump’s ambitious hiring goals of 10,000 new Immigration and Customs Enforcement agents and 5,000 U.S. Customs and Border Protection officials within two years. Finally, while Kelly had told Fox News that Trump’s border wall would be finished within two years, the secretary told Congress that he merely expects its construction to be “well under way” by 2019.